, a learned English gentleman, was a younger son of sir John Scot, of Scot’s-hall, near Smeeth in Kent, where he was probably born; and, at about seventeen, sent to Hart-hall, in Oxford. He retired to his native country without taking a degree, and settled at Smeetb; and, marrying soon after, gave himself up solely to reading, to the perusing of obscure authors, which had by the generality of scholars been neglected, and at times of leisure to husbandry and gardening. In 1576, he published a second edition, for we know nothing of the first, of “A perfect platform of a Hop-garden,” &c. in 4to and, in 1584, another work, which shewed the great depth of his researches, and the uncommon extent of his learning, entitled “The Discoverie of Witchcraft,” &c. reprinted in 1651, 4to, with this title: “Scot’s Discovery of Witchcraft; proving the common opinion of witches contracting with devils, spirits, familiars, and their power to kill, torment, and consume, the bodies of men, women, and children, or other creatures, by diseases or otherwise, their flying in the air, &c. to be but imaginary erroneous conceptions and novelties. Wherein also the practices of witch. mongers, conjurors, inchanters, soothsayers, also the | delusions of astrology, alchemy, legerdemain, and many other things, are opened, that have long lain hidden, though very necessary to be known for the undeceiving of judges, justices, and juries, and for the preservation of poor people, &c. With a treatise upon the nature of spirits and devils,” &c, In the preface to the reader he declares, that his design in this undertaking, was “first, that the glory of God be not so abridged and abased, as to be thrust into the hand or lip of a lewd old woman, whereby the work of the Creator should be attributed to the power of a creature secondly, that the religion of the gospel may be seen to stand without such peevish trumpery thirdly, that favour and Christian compassion be rather used, towards these poor souls, than rigour and extremity,” &c.
A doctrine of this nature, advanced in an age when the reality of witches was so universally believed, that even the great bishop Jewel, touching upon the subject in a sermon before queen Elizabeth, could “pray God they might never practise farther than upon the subject,” exposed the author to every species of obloquy and persecution; and accordingly Voetius, a foreign divine, informs us in his “Disput. Theolog.” vol. III. p. 564, though Wood says nothing of it, that his book was actually burnt. 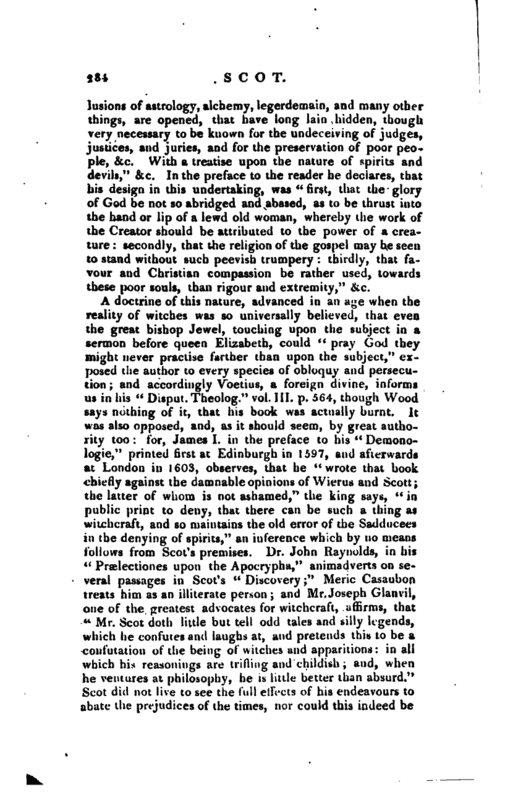 It was also opposed, and, as it should seem, by great authority too: for, James I. in the preface to his “Demonologie,” printed first at Edinburgh in 1597, and afterwards at London in 1603, observes, that be “wrote that book chiefly against the damnable opinions of Wierus and Scott; the latter of whom is not ashamed,” the king says, “in public print to deny, that there can be such a thing as witchcraft, and so maintains the old error of the Sadducees in the denying of spirits,” an inference which by no means follows from Scot’s premises. 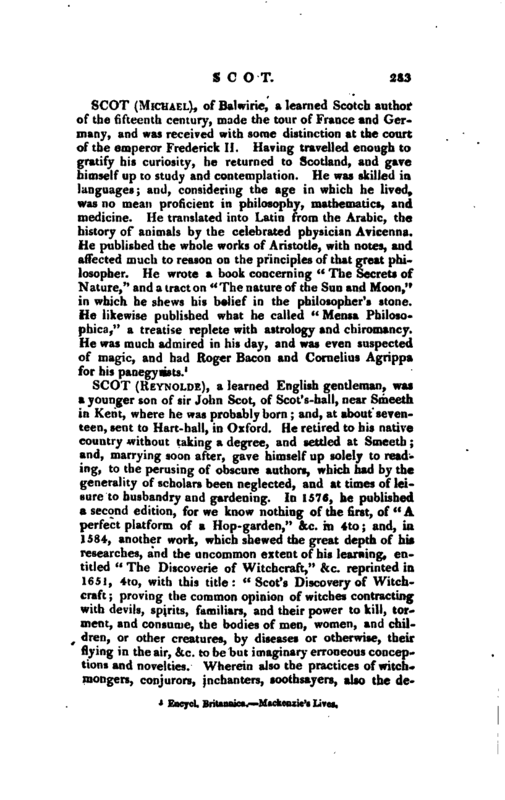 Dr. John Raynolds, in his “Praslectiones upon the Apocrypha/' animadverts on several passages in Scot’s” Discovery;“Meric Casaubon treats him as an illiterate person; and Mr. Joseph Glanvil, one of the greatest advocates for witchcraft, affirms, that” Mr. Scot doth little but tell odd tales and silly legends, which he confutes and laughs at, and pretends this to be a confutation of the being of witches and apparitions: in all which his reasonings are trifling and childish; and, when he ventures at philosophy, he is little better than absurd." Scot did not live to see the full effects of his endeavours to abate the prejudices of the times, nor could this indeed be | the work of a single hand, contending against the king on the thfone, many very learned men, almost the whole body of the people, and what was the last to yield, the statutelaw of the land. His work, however, was reprinted in 1651, 4to, and in 1665, folio, with additions, and was translated into German. Ath. Ox. vol. I. Oldys’s Librarian, p. 213. 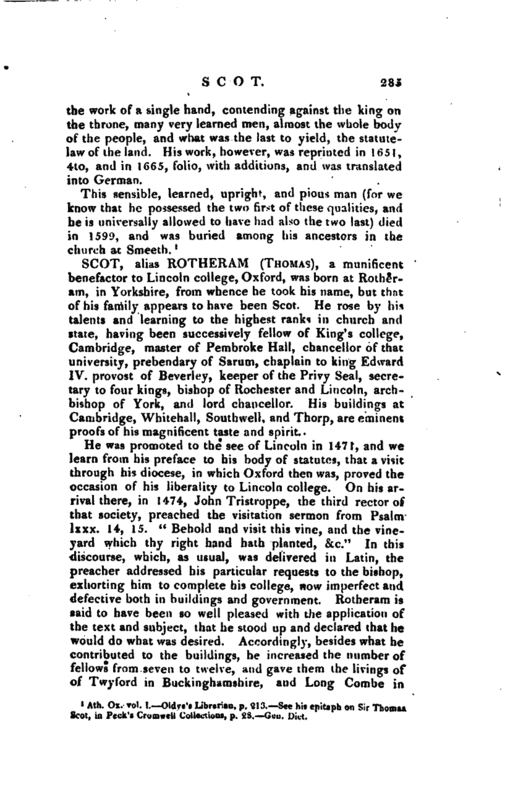 See his epitaph on- Sir Thomas Scot, in Peck’s Cromwell Collectious, p, 28. Gen. Dict.